Downing airliners is always a good ploy and excuse for expanding the police state. So it comes as no surprise that everyone in power has decided that the Metrojet airliner downed in the Sinai is a victim of the Caliphate. Such an evil organization MUST be about doing evil things. CNN reports that the Caliphate has claimed downing the aircraft. 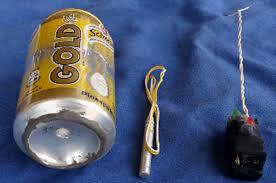 In fact, the Caliphate (ISIS/ISIL/IS) released a photo of a plausible soda-can bomb, which would (based on the image) have to be a suicide type bomb. Other recent news stories report that both the Russians and Americans agree that they did. That, I suppose, makes sense, but the CNN report itself does not. Looking at it from an engineering point of view (not some political view), a standard European soda can (330 ml, slightly larger than a US can) can hold 528 grams (bit over a pound) of Composition C-4, the standard moldable (plastic) explosive since 1960 (US military), but it would (of course) weigh about 60% more than a can of soda with actual soda in it. Supposedly, both Russian and American “experts” claim it would take a kilogram of explosive to bring down the aircraft, so they state that the Caliphate’s claim could be bogus. You have to wonder if the security forces are as stupid as their opponents. First, they can’t get their story straight. Now, I realize that is a problem both with the media AND with governments. But we have seen constantly how the truth does NOT get out, and the stories just don’t add up. Second, why should a photo released by the Caliphate be truthful? It is pretty easy to rig up something that looks really good, and create a red herring. And just because the pretty picture shows a suicide-type switch doesn’t mean they couldn’t have replaced that with a timer or a bluetooth activator. Third, while there are many places on an aircraft where a kilo (or pound) of explosive can do massive, plane-killing damage, they are places unlikely for a suicide bomber to be able to get to, in flight. Or for a passenger, at any time. Not impossible, but not too likely. The story has holes in it. Fourth, if it WAS a soda-can bomb, the explosive may have been in the form of a shaped charge: less C-4 (or whatever) but more efficient: but requiring careful placement. Or it COULD have been multiple cans: a whole six-pack worth! All of this (admittedly, speculation) implies an inside job, and whether a suicide bomber or not, careful planning and execution: NOT common for the Caliphate or any other Islamist group. (Indeed, note that a common feature of attacks attributed to Islamist extremists all the way back to the1990s is the foolish way in which the attacks have been planned and executed, and the waste of resources (especially people) involved. A man with knowledge of how to place a small explosive charge in just the right place to destroy an aircraft seems too valuable to waste on a suicide mission. But an inside job like this is a WONDERFUL excuse to further control passengers and crew: we must now either prohibit sodas (not just cans, either: a 32-ounce drink cup could ALSO be used, folks!) or require weighing them and “inspecting” them. (I suspect prohibition.) And by the way, that includes the cans that the flight attendants use to serve passengers. What better way to smuggle a can of C-4 on board? This leads not just to the idea of an inside job, but a job directed by ideologically-driven and cool, calculating political powers-that-be, for the idea of increasing control of people AND excusing (justifying) more repressive measures. The list of candidates for these facilitators and puppet-masters in the case of this aircraft downing is very, very large. Lots of people hate Russians. Lots of people want to see Russia diverted and distracted and therefore more prone to up the ante for war with the West. Unless, of course, the goal is to get Russia to agree to ally itself fully with the West against… whomever. See how fun? But this speculation does not really matter. IF a bomb or bombs or something else was used and this crash was NOT mechanical failure or human error (other than that of Egypt’s equivalent of the TSA), someone intentionally killed several hundred humans. Not just humans, but humans the vast majority of which cannot be labeled as anything but innocent – their biggest crime might be not having taken action to overthrow their government(s) and therefore tacitly agreeing to their government’s actions of aggression and tyranny to whatever degree. NOT killed in self-defense, and NOT killed in revenge. Killed because they could be, to make a political point. Mechanics of bombs and aircraft and getting the bomb to the specific place at the necessary time aside, even if this was NOT done by a state, it is the kind of thing that a state’s security apparatus is not going to be able to prevent at least some of the time. No matter how draconian their measures. This entry was posted in Nathan's Rants and tagged airliner, bombs, Egypt, explosives, Russia, Sinai, Terrorism. Bookmark the permalink.